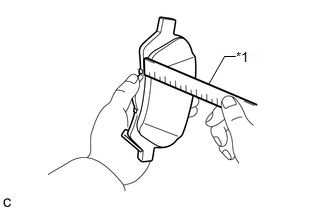 (a) Using a ruler, measure the pad lining thickness. 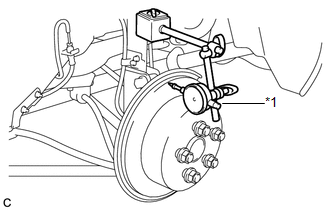 If the pad lining thickness is equal to or less than the minimum, replace the brake pads with a disc brake pad kit. Be sure to check the wear of the rear disc after replacing the brake pads with new ones. 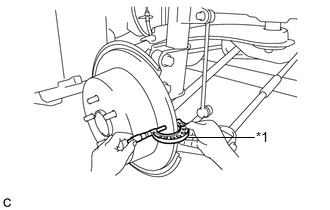 (a) Make sure that the rear disc brake pad support plates have sufficient rebound, no deformation, cracks or wear, and that all rust and dirt are removed. If necessary, replace the rear disc brake pad support plates. If the disc thickness is less than the minimum, replace the rear disc. 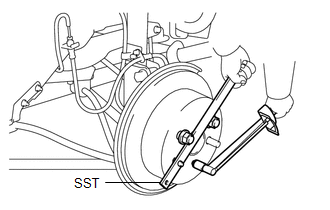 (b) Using SST to hold the disc, tighten the disc with the 5 hub nuts. (c) Using a dial indicator, measure the disc runout 10 mm (0.394 in.) away from the outer edge of the rear disc. If the runout exceeds the maximum, change the installation position of the disc to minimize runout. If the runout exceeds the maximum even when the installation position is changed, grind the disc. If the disc thickness is less than the minimum, replace the rear disc. Keep the magnetic parts of the dial indicator away from the axle hub and speed sensor. (d) Remove the 5 hub nuts and rear disc.